Keeping to time is important. When delivering your message, whether in a business setting or on stage at a music festival, timing is critical. An elevator speech is short – the door opens, it ends, and your listener is gone. Business pitches are typically allotted a set period – go beyond that and you risk irritating investors who have several other companies lined up behind you. Go beyond your time on a music stage and you might find someone (like me) killing the sound system. So tune your presentation to the target time. If you deliver crisply and get your message in before the cowbell rings, you just might find that elevator person inviting you to coffee, the investors asking you to stay for more discussion, or an invitation to play an encore. There is a reason they use cowbells at outdoor events. They make a loud noise and add to the party atmosphere. Having some “cowbell” in your delivery shows a lighthearted side and gets folks’ attention. While you probably won’t use a real bell, a bit of pizazz and theatrics – directly related to the point you are making – can make a presentation memorable and more effective. 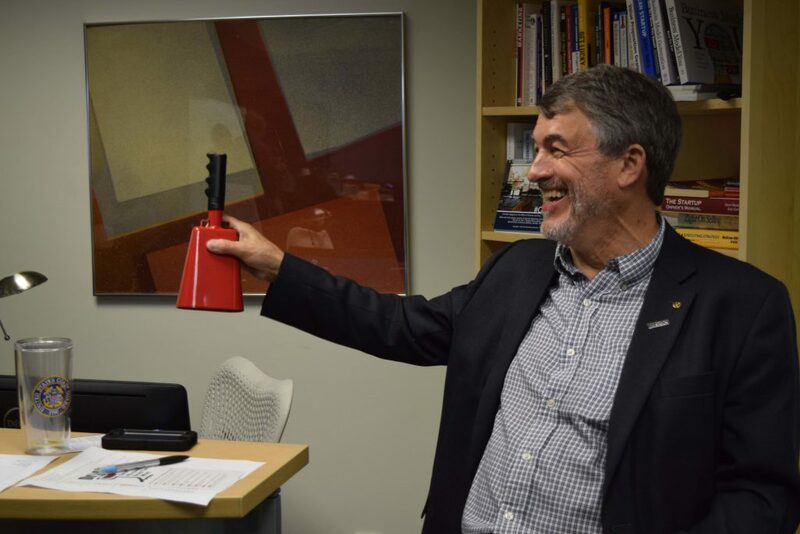 Using the cowbell at our pitch competition was a fun way of making sure participants stopped when they were supposed to, and created a festive atmosphere. Many thanks to David and Brittany who donated the cowbell to the cause. The cowbell will make its next appearance on July 18th at 757Pitch, our bi-monthly pitch competition. Check out the website for details!